FAR from being a recent trend, precariousness is actually "the normal condition of labour", said Ursula Huws at LFB's recent precarious work conference. 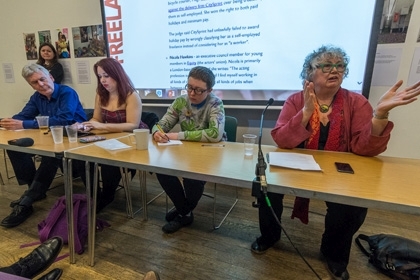 Ursula joined the NUJ back in 1970 as a Book Branch founder member and is now with LFB, as well as being Professor of Labour and Globalisation at the University of Hertfordshire. More secure working conditions came about, says Ursula, largely in the context of the Cold War. "There was a real fear that workers would turn en masse to Communism... All kinds of concessions made to labour that were rolled back later... The model was never for everybody." Women, migrants, ethnic minorities, "low-skilled workers" were excluded from job security's golden age. For example, "when we started Book Branch, we couldn't recruit (into the NUJ under its rules at the time) low-paid proofreaders working from home, as they weren't earning 60 per cent of the going rate in the area." Ursula related how Book Branch fought at the NUJ's Delegate Meeting for a rule change to allow low-paid proofreaders to join. Some five million people in the UK are now getting some of their income via an online platform (Uber, for example) says Ursula. One in 40 gets half of their income or more from such a platform - and the technology is spreading into mainstream employment. Apps that summon you to work are now used for people in salaried jobs, to log hours, for ratings by customers, performance indicators or other cyberbureaucracy. How did this come to pass? "Freelances until the 1970s were very much protected by the closed shop" - for younger readers, that meant only those who were in the appropriate union could work in the sector. The union in some cases acted as the employment agency. "Attacks on trade unions and the closed shop played a major role in undermining the freelances." Then there was the consolidation of companies and "packaging out." When Channel Four was set up in 1982, it "was all done on spec by freelances who then had to pitch." The ways that freelances found work - word of mouth, specialist directories and so on have been wiped out, now people go to Google - where you have to go down five or six pages of search engine results to find a genuine freelance, says Ursula. Standardised layout design programmes (the industry standard - first Quark Xpress and then Indesign) also created global competition. Such trends were below the radar but now they've converged. Minority practices have become the norm. Ursula Huws's recent books include Labor in the Global Digital Economy and The Making of a Cybertariat: Virtual Work in a Real World .